It has been nearly 7 years since I first ventured into the little known thunder dragon kingdom of Bhutan on a fateful morning from Bangkok. This country – sandwiched between China and India – remains one of the least visited places in the world. It was a long time dream that brought me here and during my own experience going around the country, I would have to say that my fascination with Bhutan only grew. There is a strong sense of spirituality that permeates the land – one that is only accentuated by the scenery and the kindhearted nature of the locals. By the end of the trip, I was totally relaxed in a way that no private resort could ever impel me. Bhutan is a highly mountainous country and a trip from one end to another could easily take weeks. The classic route which takes around a week brings you from Paro where most international flights land to as far as Punakha. This gives you a good overview of the country. Here are my suggestions on some attractions in Bhutan that you shouldn’t miss for a one week trip. A trip to Bhutan is an experience in itself. It’s one of the most isolated countries in the world (Bhutan certainly ranks near the top) . 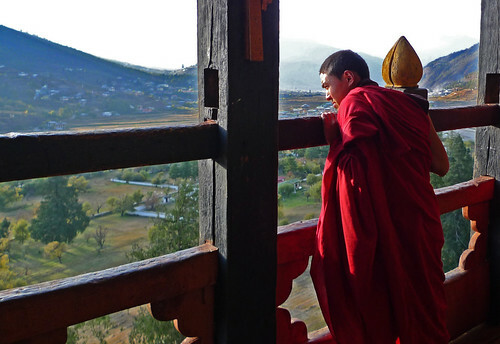 Breathtaking scenery, thousand year old monasteries, gross national happiness, a different way of life – the country certainly has a lot to offer. So if Bhutan is in your travel checklist, let me share some tips. I’m not claiming to be an expert here, but I reckon I can shed light to some things. I suppose there aren’t really a lot of other people around who can give tips for Bhutan so here goes…. It is said that the highlight of any trip to Bhutan is the trek up to Tiger’s Nest Monastery. All the travel guides that cover this country inevitably include pictures of this building and it is clear to see why. Hanging on a precipitous cliff at 3,120 meters above sea level, the monastery – also known as Taktsang Goemba – is “nested” right smack in the middle of steep rocks that are almost vertically sloped. Though looking pretty much isolated and hard to get to, there are actually a few well-used access points to reach Taktsang. As the grand finale of our trip, we took the most popular (though by no means an easy) route and started our climb at about 9:30 in the morning. As much as I was looking forward to seeing the monastery, I was dreading the climb. I read personal accounts in the online forums which mentioned how difficult it was, and how altitude sickness could affect some folks. But nevertheless – coming to Bhutan was a unique experience in itself and I was determined to make it all the way to the top on foot. As our guide had this habit of being tardy, we agreed to meet earlier the next morning – our third in Bhutan. We headed to Wangdue Phodrang – the easternmost part of the country that we got to visit during this trip. The relatively short distance from Punakha to Wangduephodrang was filled with rice terraces that extended high up in the mountainside. It was common to hear the farmers singing as a group while they harvested the season’s crops. The main town of Wangduephodrang is situated on a hill, outside the dzong. The dzong itself is smaller, and not as well-maintained as its counterpart in Punakha. However, it is unusually shaped, and its exterior walls seem to follow the contours of the hill – something I didn’t see in the other dzongs…. Woke up at 6:30. Our guide was not going to pick us up until 9 but I decided to take my morning walk around Thimphu. My other companions were still in la-la land. I peered out the window and the sky was a total gray like the day before. The morning air was quite cold, yet I still pursued my plan of walking to Trashi Chhoe Dzong near the northern end of the city. This “walk” took nearly 30 minutes and entailed a distance of 2 to 3 kilometers each way. I passed by many curiosities – government buildings draped with ornate paintings, schoolchildren dressed in the national costume making their way to school, passers-by looking at me curiously… it was a mix of these as I observed the people around me starting their days. I arrived at the dzong, took some quick snaps, had a short conversation with a security guard, then turned back using another way. From the ground, Thimphu seemed much more compact than it looked when we viewed it from high up. There were lots of open spaces and natural greenery that weren’t so apparent previously. 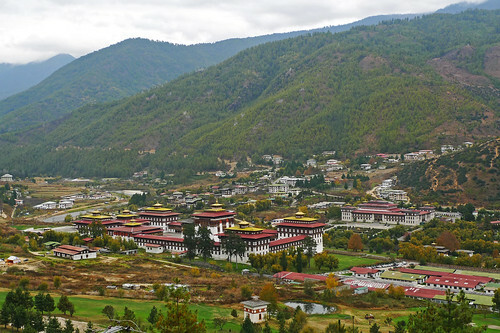 Thimphu is easily one of the most scenic capital cities in Asia…. It was still dark. The alam clock read 4:30AM. Having just arrived in Bangkok the night before from a roadtrip down to Udon Thani from Laos, my mind was still in a murky haze. My companions sleeping in the other bed seemed oblivious to the loud ringing sound emanating from my phone. This was the day we’re flying to Bhutan – the country famously isolated by the Himalayas, where Gross National Happiness is prioritized over economic growth and where the king famously abdicated voluntarily in order to initiate a move to a constitutional monarchy. We were all trying to catch an early morning flight to Paro – Bhutan’s only airport, aboard DrukAir, the only airlines that flies to Bhutan. Having been to several flights the days prior, my plan was just to go to sleep as the plane cruised its way past Burma, India and into Bhutan. But alas, the pilot made an announcement about Kangchenjunga (3rd highest mountain), and then Mt Everest being visible at the left side of the plane. I opened the window and there they were – a few snow-capped peaks towering above the clouds. It also meant that our approach at Paro Airport was coming soon. The plane descent into Bhutan that came fifteen minutes later has got to be the best plane landing ever – with the plane making 2 or 3 sharp turns during the final descent, evading mountains 5,000m above sea level across all directions and which are only a few meters away. Paro Airport is also one of the most scenic airports in the world, being in the middle of a relatively narrow valley in Western Bhutan….